Whether your party's exploring muck-drenched catacombs or sea caves at high tide, no Game Master wants to spend time drawing every murky eddy and damp dungeon. Fortunately, with Paizo's latest Pathfinder Flip-Mat, you don't have to! This line of gaming maps provides ready-to-use fantasy set pieces for the busy Game Master. Whether you need a sea monster's lair, a ruin buried by the waves, or a temple literally dripping with evil, this double-sided map makes the perfect setting for any sunken or subterranean dungeon delve! Don't waste your time sketching when you could be playing. 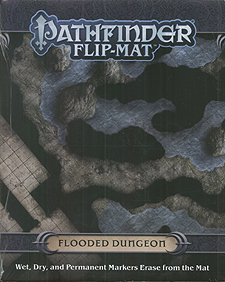 With Pathfinder Flip-Mat: Flooded Dungeon, you'll be prepared next time your party's ready to dive into adventure!